Managing Editor at our sister site, Jumper Nation. Have you ever dreamed of writing about your sport for a living? Do you have a perspective and a direction for the hunter jumper universe that you want to share? Are you a self-motivated, well-spoken individual who isn’t afraid to put in the hours for a dream and a paycheck? Jumper Nation — the newest member of the Nation Media tripod — is looking for a unicorn Assistant Editor who could handle day-to-day operations that include writing articles, coordinating and editing submissions, wielding the power of our awesome social media networks, and being a deciding voice in growing what JN is and what it will become. This position has the potential to operate as a full or 25-30 hour part-time role for the right person, and is 100% remote. Some travel and coverage of events is possible depending on your location. Salary will be commensurate to experience. Connecting to leaders, companies, and event organizers to bring in outside content and contributors. Coordinate with other Nation Media Editors to maintain strong voice and cross-post breaking and universal news. The invaluable resource and voice of the hardworking competitor at all levels and every income. In a sport where the attention can be so focused on only the richest and best, the average amateur and professional riders who are truly the financial and emotional backbone of the H/J world are often overlooked. We strive to help define the best moments of the elite, widely distribute the captivating stories of the underdog, and generate content that enriches every reader’s connection to their horse, their barnmates, and their discipline. Come help us tell stories that people will want to talk about in the barn aisle — stories that ultimately betters the sport and the people in it. Please send a resume and two writing samples (or links to writing samples) to our editor-in-chief, Lorraine Jackson at [email protected] with “Assistant Editor” in the subject line. Pull out the hay bales and hide the manure pit, y’all: we’ve got a barn wedding to put on! On the equestrian/actress’s 32nd birthday, her FEI-level boyfriend of two years Karl Cook popped the big question with a rock worth more than your truck and trailer, and she said yes! The two can often be spotted together on the West Coast circuit shows, from HITS Coachella to Del Mar. They also share a stunning chandeliered barn in Southern California that we think would be ideally suited for some exchanging of vows if we do say so ourselves. Kaley Cuoco, best known for her role of Penny on CBS’s The Big Bang Theory, has been an equestrian longer than she’s been famous, and has always found ways to ride. At one point Cuoco and her two co-stars Johnny Galecki and Jim Parsons were making $1 million per episode, but they reportedly took a voluntary paycut to even their salaries with newer cast members Mayim Bialik and Melissa Rauch. Kaley has a handful of FEI performances to her name, including the Longines Masters in LA in 2016, and has had many successes in the high J/AO divisions with her talented string. Karl Cook, who long before he was dating a Hollywood starlet had a reputation for audacious looks in the ring and exploding with personality on the circuit, has had an impressive career in his nearly 27 years. (Fun fact: if the FEI Database is to be believed, Karl’s birthday is Christmas Day!) In his youth he made three appearances at the NAJYRC and in his professional career, three appearances at the World Cup Final (One aboard his current mount Tembla and twice on Jonkheer Z). In his first NAJYRC performance, he won the individual AND team show jumping final. He’s also been on a handful of Nations Cup Teams, most recently the Nations Cup in Langley, British Columbia in 2016 where Team USA came in fourth. In addition to sharing a passion for Show Jumping, both Kaley and Karl are also passionate advocates for animal adoptions and rescues. Kaley has been a spokesperson for The Humane Society and has flown around the world to bring awareness to a variety of animal plights, and Karl has taken up a more public banner on the topic since meeting her. Kaley’s many dogs are all rescues. Basically, despite being huge stars in their fields and absurd amounts of money, they seem to be some of the nicest people you’ll ever meet, and we wish both of them all the happiness and horse shows in the world. Follow Jumper Nation at www.JumperNation.com, on Facebook, and on Instagram. Stable View Farm Main Barn. Courtesy of Stable View. When an advertiser comes on board with any of Nation Media’s clusters of internet insanity, we try to prepare them for what’s about to go down. They’re going to come face-to-face with the most rabidly obsessed, educated, hilarious, industrious collection of humanity in all of Equestriandom. Our readers are people who work all day and then will literally duct-tape a flashlight to their helmet in order to get a ride in at night during the winter. They scrimp and save on luxuries for themselves to give their horses the best of everything. And they can smell fear. Which is why we only partner with companies who get that, who are part of that, and who want to help you spend your hard-earned dollars on quality products, nutritious feeds, and once-in-a-lifetime experiences. For all of the above reasons, we’re thrilled to welcome the iconic Stable View Farm of Aiken, South Carolina to the EN family! Since Barry and Cyndy Olliff purchased Stable View in 2010, they’ve been putting their hearts and souls into making Stable View “A Gathering Place” for riders who are local, those who are flying south for the winter, those who are committed to the lower levels of the sport, and those who exemplify Eventing High Performance. An aerial view of the covered barn and surrounding landscape. Photo courtesy of Stable View. 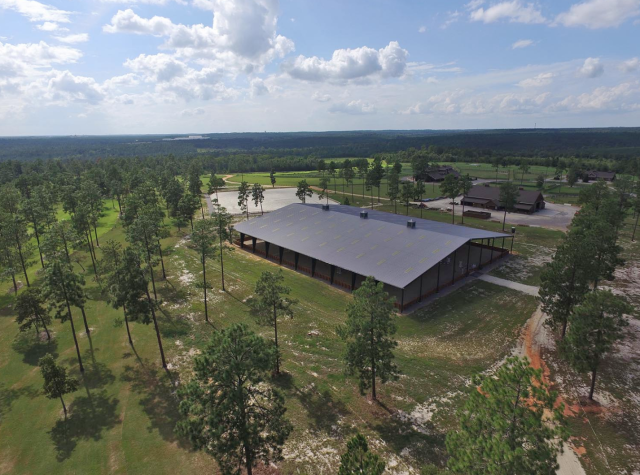 The absolutely stunning facility boasts five beautiful barns, multiple cottages and apartments for boarding of the human variety, acres upon acres of lush Carolina turnout, a state-of-the-art covered arena with Attwood footing (another of our awesome sponsors! ), numerous outdoor arenas and derby fields, and obviously, their cross country course which runs Beginner Novice through Advanced across their 1,000 acres of turf, hills, and forests. 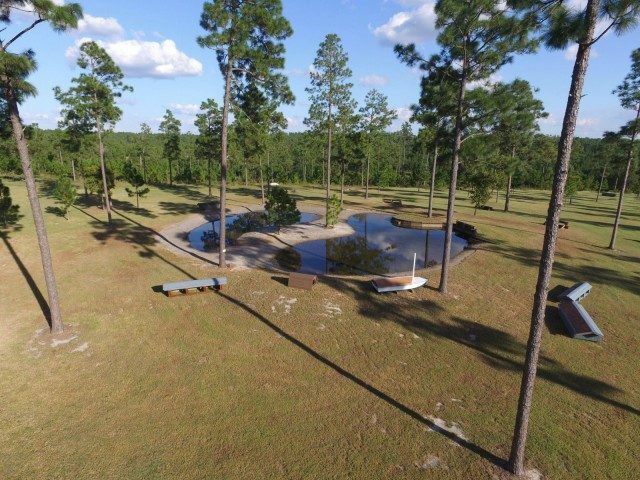 Eric Bull and Captain Mark Phillips have designed a marvelous track for all levels that focuses on giving all riders a test but with as many safety features in place as possible, including multiple fences with MIM Clips. A water complex on course. Photo courtesy of Stable View. 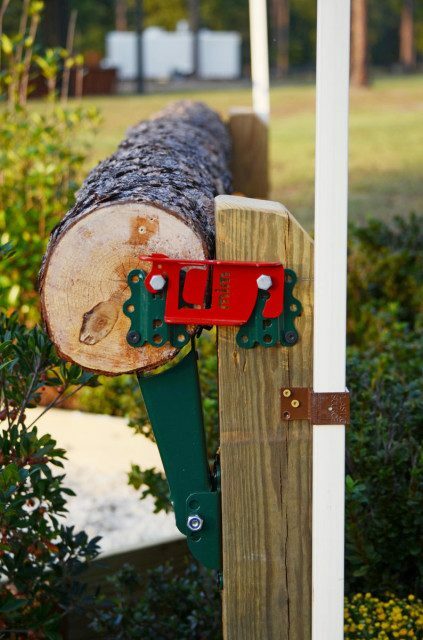 One of many MIM Clip fences on course. Photo courtesy of Stable View. 1 – Spectate. Tomorrow, for example, you can go observe the Stable View Fourth Annual Southeast Hunter Trials, which includes gallivanting around cross country in Foxhunt attire as individuals and in teams/pairs. It’s going to be partly cloudy and 61 degrees. Just saying. 2 – Compete. Stable View hosts a DIZZYING number of events this winter, including Jumper Nights, schooling and recognized Dressage shows, an Eventing Academy, and three horse trials between January and March alone. 3- Board There. With darling cottages and plush apartments as well as the numerous barn options, you and your whole team can fly south (or east, or north or heck, even ditch the European indoor eventing business and hop the pond, won’t you?) for the winter and set up camp. Obviously, space is limited, so contact Stable View soon if you’re itching for a long term roadtrip. 4- Volunteer. Can’t bring your trusty steed with you? Consider being a volunteer for one of their many events and get the warm fuzzies of bettering yourself and your sport while enjoying the South Carolina sunshine. No. Brainer. We’re beyond glad to have Stable View Farm not only on Eventing Nation, but as part of the eventing community. We’re a better sport for having them in the mix, and we can’t wait to see what else is in store for the future! Rio Olympian Amy Millar made it a home-country win for spectators at the Royal Agricultural Fair and Royal Horse Show last weekend, and she did it with one arm behind her back, proverbially speaking. Or quite literally, she did much of it short a stirrup but still managed to make it look like a textbook ride. Amy and Heros 86 came into the final night of the three-round competition with some penalties from night one, but jumping fast and clear rounds on Saturday allowed her to clinch her first ever national championship title. At ten years young, Heros 86 is already an Olympic veteran, but still has a huge career ahead of him. The Belgian Warmblood is owned by a syndicate of Amy’s friends who have known her much of her life and rallied together to get her the ride on the talented gelding. International competition started at The Royal Tuesday night, with the FEI World Cup on Wednesday night. We saw other Canadian greats like Amy’s father Ian Millar, Tiffany Foster, Keean White, Ali Ramsay, and hailing from below the border, top-ranked Americans Kent Farrington and McLain Ward. Go Amy, and Go Jumping! Jessica Springsteen announced earlier this week that she has officially added Volage du val Henry to her string after spending the summer getting to know the mare and dabbling around the European circuit together. The eight-year-old Selle Francais mare came to Jessica through Edwina Tops-Alexander, who had the ride on the mare through the 2016 season before taking time off for her pregnancy. 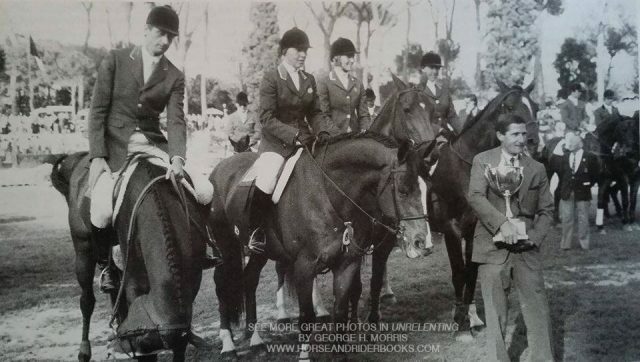 “Volly” then went to Alberto Zorzi of Italy along with the rest of Edwina’s string, and he successfully campaigned the mare around Europe through the winter season and early spring, from young horse classes all the way through CSI 5* divisions. Jessica starting taking the mare into a few classes here and there starting in May, and the two had strong finishes, including five top ten finishes. They took fourth in a CSI 2* class in Valkenswaard their first weekend out together, and a fourth place finish in July in a 1.45m young horse class. Volly came up the show jumping ranks under the watchful eye of Ronan Lerat of France, who premiered the mare in the FEI ranks in early 2015 and handed the mare off to Edwina in mid 2016. Even early on, she showed a great deal of spitfire and talent. The mare was bred in Switzerland by Ms. Helene Amar and she has simply extraordinary bloodlines. (Sire: Quidam de Revel SF, Dam: Cassina, Sire of Dam: Cassini I.) Unquestionably, she was born to jump, and appears to have the personality and character to match. 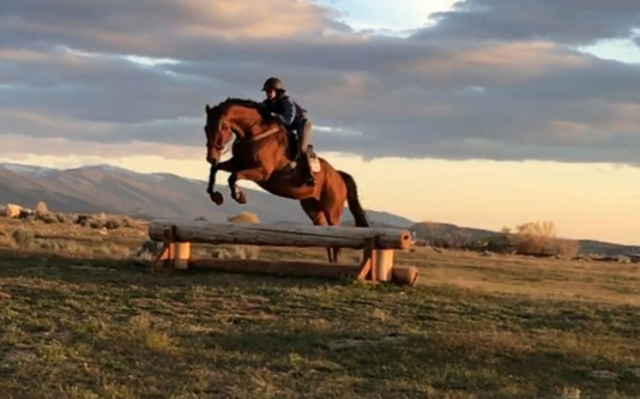 We always love seeing a fiery chestnut mare out on the circult doing her thing, and we think she’ll prove to be a lovely match for the talented rock heiress. Congratulations to Team Springsteen on your new acquisition, and Go Jumping! Do you have a turnout blanket in decent condition, but are swooning for an upgrade this winter? We have the perfect solution that not only makes it more affordable for you to trade up, but also gets your old turnout onto the shivering withers of a horse that desperately needs it. Horseware has announced the relaunch of their wildly popular Turnout Trade-In Program, where you hand in your old but still useful turnout, and in exchange you get $50 off a brand new Rambo. So who are the fine recipients of your trusty old rug? We’re glad you asked! Only a handful of the cutest ponies, the kindest drafts and the best charities you could ever hope to meet. 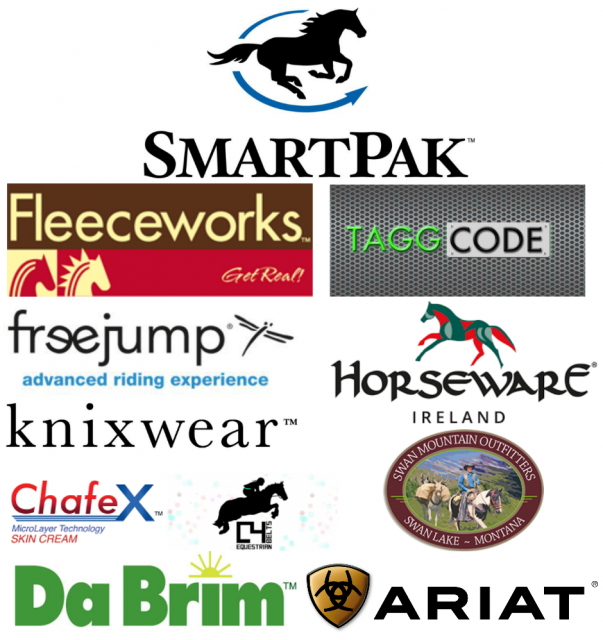 Horseware shares with us just a handful of the numerous hardworking beneficiaries of last year’s Trade-In program, and why it means so much to these groups to get your old blanket. The Mare and Foal Sanctuary in the UK not only takes in abandoned and neglected animals of all shapes, sizes, and ages, but they also train and re-home them into better situations. Some remain at the farm permanently as part of the top notch children’s education program where little ones can learn all the aspects of horse care and science. The second highlighted charity is the Devon Equine Crisis Support, which works in conjunction with the Welsh Pony Rescue & Rehoming Project in the UK. They introduce us to the wildly handsome and charming Tada, a stunning piebald who had a body score of 0.5 when he arrived, but miraculously recovered and is the picture of mischievous health today. You break in that Rambo with everything you’ve got, Tada. Are you ready to help some horses and get your own Rambo? It’s easy! Visit Horseware’s Turnout Trade-In Page and fill out the voucher form, then click on Participating Retailers to find the closest drop-off location, and they’ll take care of the rest! Next thing you know, that faded but cozy rug will be bringing care and warmth to a horse that needs it, and your pony will be strutting their stuff in a new Rambo. Your turn-in blanket can be any brand or fill, so long as it’s still in working condition. Go Horseware, and Go Eventing. Editor’s Note: Horses can be fragile, dangerous, unpredictable, and most of all expensive, and sometimes that places people in the horse business on precarious legal ground. Armande Leone of Leone Equestrian Law tackles some of the common and uncommon legal battles that can arise in the sport. In this case, a horse was purchased for $250,000 and shipped to Mexico. At the first competition, the horse allegedly started stopping and went lame. The owner sued on the basis that there was misrepresentation as to the horse’s past performance and soundness. The seller denied the allegations and claimed that the new owner didn’t properly prepare the horse for competition, causing injury. The horse is now supposedly valued at $30,000. Who’s right, and who’s wrong? Although a jury will ultimately decide who wins, the actions of the seller, the buyer, the trainer, and veterinarian will be determinative. A seller or seller’s agent’s representations about a horse’s past performance and prior injuries are important to a purchaser’s decision. Findings by a buyer’s veterinarian on the pre-purchase examination and the trainer’s advice about the suitability of the horse for the buyer are also important to a purchasing decision. The interplay of these factors determines whether or not a seller is liable for a horse purchase gone bad. A seller’s material misrepresentation about a horse’s past performance or lack of injury can be a basis for a purchaser to sue for monetary damages, provided the information was known to the seller, and it was not revealed. A material misrepresentation would be saying that the horse competed successfully in 1.50 meter classes but actually never jumped above 1.20 meters. Not disclosing that a horse was laid up for 10 months for a suspensory injury to the buyer or the buyer’s veterinarian at the time of the pre-purchase exam would also constitute a material misrepresentation that is actionable. If a purchaser relies on such false information in making the decision to purchase, a seller can be liable for fraud. However, a seller can disavow any representations or warranties about the horse by selling the horse with a bill of sale “as is”. Selling a horse “as is” does not necessarily protect a seller from liability from all defects in the horse, such as a breach of the warrantability of merchantability. But a bill of sale can specifically disavow a warranty of merchantability, a warranty of the horse’s fitness for the intended use and warranty of the horse’s health and soundness. Material misrepresentations by the seller that were unknowable by the purchaser, purchaser’s agent or purchaser’s veterinarian are what form the basis for a successful lawsuit against the seller. On the other hand, a seller has a right to rely on the purchaser to perform his or her own independent pre-purchase veterinarian examination and to receive independent advice about the suitability of the horse for the intended rider. If a pre-existing injury was reasonably discoverable by the purchaser’s veterinarian but was missed, the issue may be one of veterinarian malpractice rather than seller deceit. Some horses have underlying injuries that are unknown to the seller or are in the process of developing at the time of the sale. If the horse had a history of performance problems with water jumps, and this was known to the purchaser’s trainer or agent, the seller has a right to rely on the purchaser’s knowledge and assumption of the risk that the horse may not jump the water. A trainer can confirm the horse’s competition record by checking with the USEF and FEI. In the Florida lawsuit, a jury will have to look at the performance of the horse leading up to the sale. What representations, if any, did the seller make? What did the pre-purchase examination reveal? 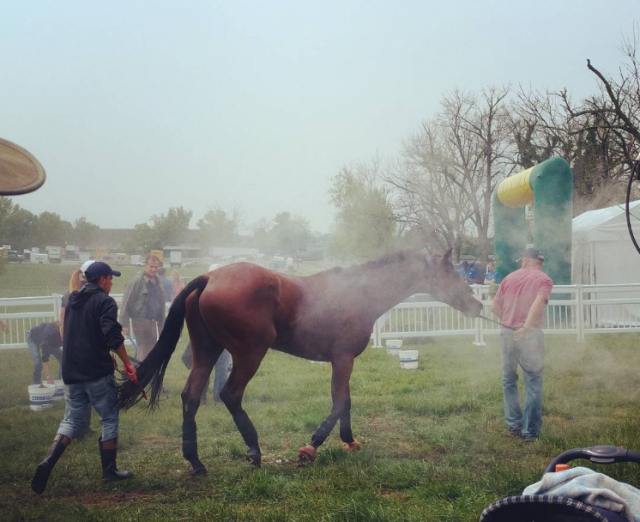 What did the purchaser’s trainer know about the horse? What did the purchaser do after taking possession of the horse? Was the horse treated according to the standard of care required to prepare for and ride a horse in competition? Were competition records supplied or readily available? Did the horse suffer a new injury after purchase? Was there a material misrepresentation or undisclosed condition that was known to the seller but unknowable to the purchaser? This lawsuit should serve as a reminder that sellers and buyers both have responsibility when agreeing on a horse sale. Sellers need to disclose information known about a horse’s past that is known to them and not reasonably knowable by the purchaser. Buyers need to make sure their trainers and veterinarians examine the horse’s performance, character and soundness sufficiently to alert them to any underlying problems. Buying a horse is risky business under the best of circumstances. It is always an unpleasant situation when a new horse purchase fails to meet the buyer’s expectations. Whether legal action by a dissatisfied buyer can be successful depends on the totality of the circumstances surrounding the purchase. In the Vorst case, it is up to the jury to consider all the relevant factors and make a decision. Update: Since Mr. Leone first wrote on this subject, the jury found that a Special Verdict form was necessary which had a bit of a split decision, and the final determination is still ongoing. T. Randolph Catanese, Esq. of Catanese & Wells represented Mr. Zendejas, the seller, in the case above and provided some additional clarification on the state of the lawsuit. Many thanks to Mr. Catanese for reaching out and for the additional clarification. Have a legal question for Leone Equestrian Law? Send an email to our editor at [email protected], and your question could be featured in a future column! The lads from Ireland were a sight Friday night as they all beamingly took their victory gallops at Ullevi Stadium Friday night following their European Championship victory. They’ve overcome a heap of problems, curses, and strange seasons to strike at the perfect moment and take one of the sport’s most prestigious prizes. With Bertram Allen opting not to start after a frightening fall from Hector the previous day, the Irish Team would have no drop score, putting the weight heavily on Shane Sweetnam, Cian O’Connor and Denis Lynch to have the best rounds of their careers. Right away the window for glory started to open when the Swedes — leading after two rounds of competition — added a time fault from Henrick von Eckermann, and then saw a shocking retirement for Malin Baryard-Johnsson. This put the pressure on Douglas Lindelow and Zacramento, who unfortunately would have two rails and a time fault to drop Sweden out of the gold medal spot. With Shane Sweetnam and Chaqui Z leading off with a spectacular clear and setting up a momentous game plan for victory, Denis Lynch moved the chess pieces forward right after him aboard the veteran stallion All Star 5. By the time Cian O’Connor came in the ring, he knew he had a rail in hand to win it, but was deadset on bringing home a zero. Good Luck gleamed under the lights and took every moment in stride, with Cian grinning ear to ear as they took the last fence and Swedish fans erupting with joy for the boys of the emerald isle. Peder Fredricson went on to put in a clutch clear round for Sweden to keep them in the silver medal spot in front of their home crowd – an enormous achievement for the Nordic team. Switzerland found only one clear round in Martin Fuchs and Clooney today, but they scraped by Belgium to take the bronze by less than a penalty point. Germany found themselves out of the running in fifth, and the Netherlands had a redemptive day after two dismal early rounds of competition to ultimately finish sixth. Team Gold is no doubt equally as sweet for Chef d’Equipe Rodrigo Pessoa, who was hired by Ireland specifically to overcome several years of bizarrely unsatisfactory team results despite the shocking stream of talented horses and riders at Ireland’s disposal. Whatever he’s doing seems to be working. Rodrigo echoed the sentiments that the Irish seem to love battling from behind, and Friday he focused that energy into winning rounds. Winning Team Ireland ,Chefd’equipe Rodrigo Perssoa, Shane Sweetman,Denis Lynch,Bertram Allen and Cian O’Connor. Texas is reeling from Hurricane Harvey, with record floodwaters in Houston displacing 30,000 people from their homes since the Category 4 storm made landfall on Friday. The death toll rose to five yesterday. More than 450,000 people are expected to seek federal aid, according to the the Federal Emergency Management Agency. The people and animals impacted by this monumental disaster are in our thoughts and prayers, and we’ve compiled information for those interested in helping Houston residents and horse owners. To help our human friends: We suggest making a simple donation to the American Red Cross or giving blood at one of the local blood banks in your area. Blood donations are always low this time of year, and it will be even more helpful now. Humane Society standing by for animal rescues outside East Texas. Photo courtesy of HSUS. To help our animal friends: There are a few groups doing rescue operations on the ground who would no doubt appreciate a little financial support. Please keep Texas in your thoughts this week. We know they’ll be in ours. We love swapping jumper fashion ideas on Jumper Nation, especially if there’s a way that we can pinch a penny and still get you in the ring looking and feeling like a million bucks. But we also want you staying on the up and up with the officials and staying within the boundaries set by the USEF for ring attire. We spoke with Dana Frank, a USEF and FEI Level 1 Jumping Steward, to get the full lowdown on attire expectations and what to expect if there’s a problem. First off, she sagely suggested going straight to the USEF Rulebook for Jumpers. The most important thing to know is that there are THREE main distinctions in attire: Formal, Proper, and Standard. If your class calls for formal attire, you’re definitely going to want to store your show-stopper for another day. “According to this rule, pink, bright blue, etc, are not appropriate attire for a class with these specs,” Dana told us. Follow the George Morris rules of tradition and stick to black, navy, dark gray, or a deep forest green option or similar. Only white or fawn breeches are acceptable at this level, and your shirt must have a white collar and white cuffs. For proper attire classes, you can stretch your legs a bit – coats of any color and shirts of any color are kosher, so long as your shirt has a collar and tucks in. How Do I Know What My Class Requires? Every prize list must outline explicitly which divisions require which attire. Often evening classes, championships, and classics will require formal attire, but some shows might require formal attire all week. You should ALWAYS check your specific show’s prize list for guidelines. Some shows will also require that riders be in at least proper attire to walk the course, and this too will be outlined in the prize list. Generally, it never hurts to go in the ring and present yourself to the judges looking anything but your very best. Dana’s course of action is a generous one, and a courtesy, not a guarantee. It’s important to follow the rules not only to save your own hard-earned competition week from disaster, but also to respect the show, the officials, and your fellow competitors. Follow the rules of good fashion, have fun with it, and Go Jumping! Katherine Newman and Dandelion have taken over the lead in Round 2 of the Platinum Performance/USHJA Green Hunter Incentive Championship with a 265! There are just 30 remaining in the 3'3" before we wrap-up Round @. Katherine Newman and Dandelion displayed spritely, forward momentum over Wednesday’s course at the Platinum Performance / USHJA Hunter Incentive Championship, and the round seemed to sway the whole week in a new direction, with all the day three rounds mysteriously seeming much more energetic after their high score on day two. An 11-year-old Dutch Warmblood mare, Dandelion looked absolutely deadlocked on the course from the first fence, and moved through the course with significantly more energy and momentum than the slower style that often typifies top hunters, and the judges rewarded it handsomely. The mare likely owes this forward style to hunters being her second career – she was previously competing in the jumpers in Europe before coming to America and switching gears to the judged ring. For their spectacular round, they skyrocketed from 14th after round one to second place after round two. The following day, the pair came back on a clean slate score for the championship, and once again put in a top notch performance, ultimately earning the reserve championship behind Scott Stewart and Playbook – who rode much more forward in their final round than they had on Tuesday or Wednesday. But it may be this forward, engaging round that people remember for years to come. Winning rounds can be viewed on EqSportNet Facebook Page, or with a subscription you can livestream the full event on their website. Jumper Nation offers a dynamic array of engaging content custom curated for hunter/jumper enthusiasts. In addition to aggregated horse show news and results, we feature rider profiles, training tips, barn tours, style guides and much, much more, all complimented by a vibrant social media presence. Check us out today! 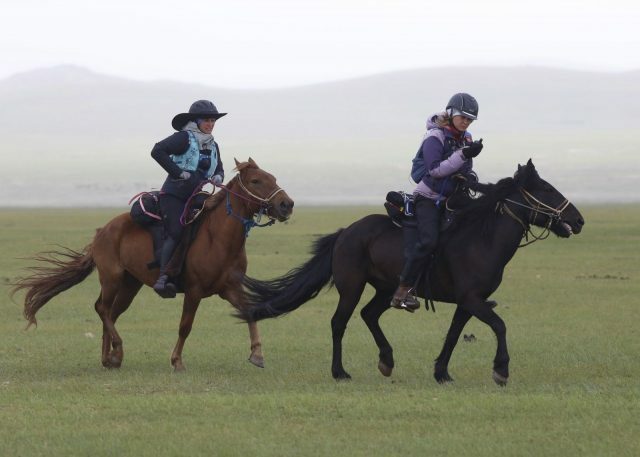 Wylie vs. the Mongol Derby, Powered by SmartPak: Leslie Leads Day 1! Leslie Wylie leaving horse station 2 on day 1 of the 2017 Mongol Derby. Picture by Julian Herbert/Mongol Derby/The Adventurists. 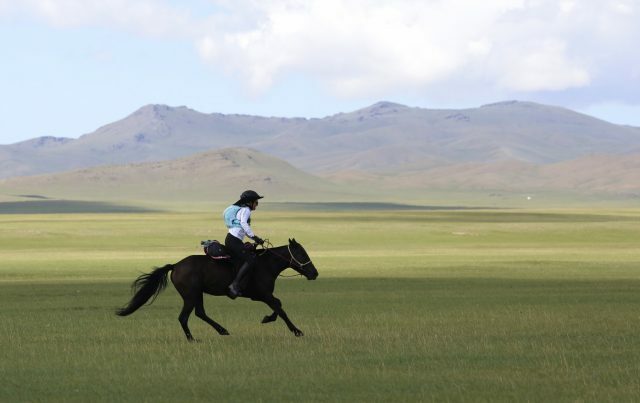 All of us woke up to see our own Leslie Wylie well out in front on day 1 at the Mongol Derby! The ponies set off at at 10 a.m. Mongolian time (10 p.m. EST last night) from that little green flag, and 12 hours later, that little red dot at the front of the pack is our very own Leslie Wylie. She was the only rider to make it to the third checkpoint in time to get vetted, supply up, and move on before the official end of day one, when all riders must dismount and camp for the night. 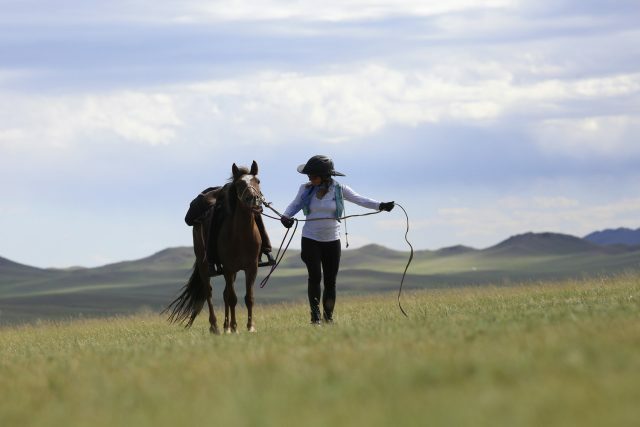 This means that Leslie will have a good head start on the competition going into day two, and also means that she’ll be sleeping on the steppe with only her hobbled pony for company. Leslie Wylie arriving at horse station 2 on day 1 of the 2017 Mongol Derby. Photo by Julian Herbert/Mongol Derby/The Adventurists. Leslie’s camping spot for the first night. Then we zoomed in on her camping spot for the night only to discover that she made it to at least some form of civilization, at least by Mongolian standards. 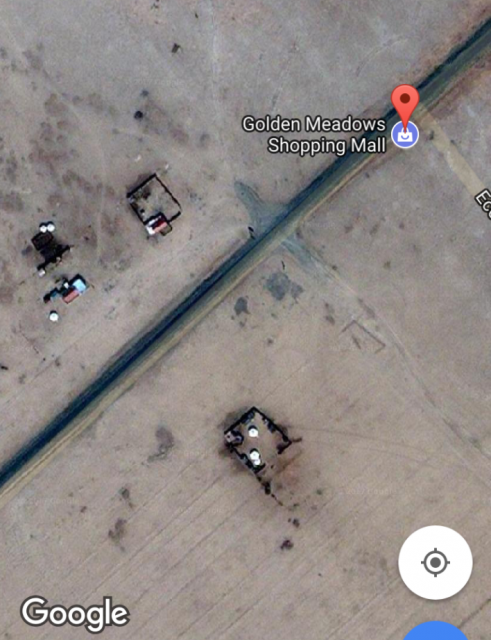 We doubt the Golden Meadows Shopping Mall has a P.F. Chang’s, but it’s far better than sleeping exposed to the elements out on the steppe! All of the riders completed two days of training with much success, and reports on the ground say it’s a reserved and focused group of riders. Leslie is probably saving her wine for later, as we can assume from this report. The competitors wrapped up race preparations in prayer with the local lamas, who prayed for a safe journey for all horses and humans. 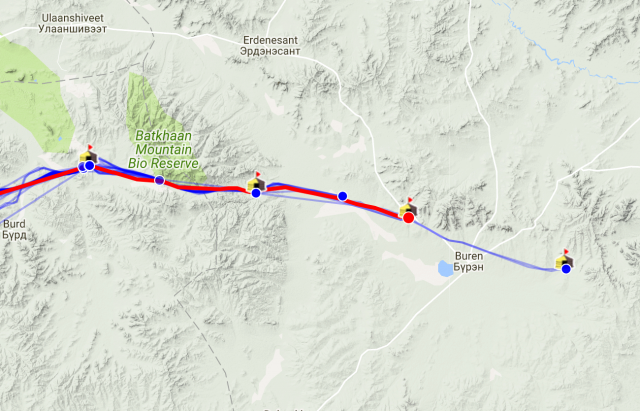 It was a gorgeous day on the steppe to start the race, with heavy rain moving through briefly in the early afternoon, but appearing to let up in the overnight hours. On the outset, it looks like the horses were ready to run, and we can’t wait to see what other ponies will make appearances in the weeks to come. According to one of the on-site vets, they’re a “strapping set” to get going! So far, no major problems to report on course for any of the riders. There has been one reported injury so far. Pierre Germaine from Owings Mills, Maryland had to get stitches on his face, but got right back in the saddle and pushed on. Early on, riders had the choice of following the course over a fairly intense ridge, or going a longer flatter route, and it appears the riders who stayed the course but took on the elevation change (including Leslie) made out better, arriving at the first checkpoint ahead of the long flat routers. 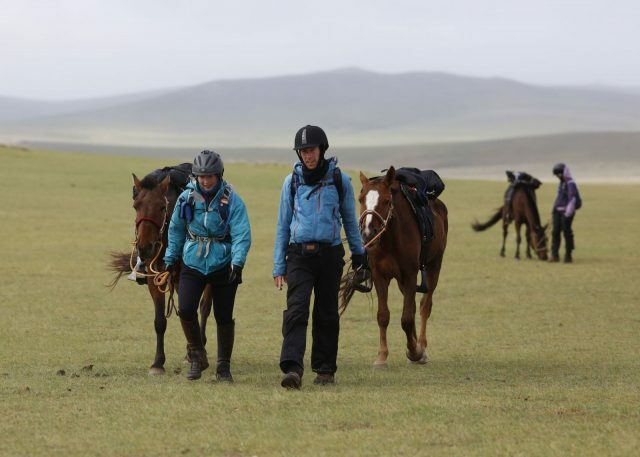 All of the riders have made it to at least the first checkpoint, with 13 riders bunked in at Urtuu #2, eight riders stopped at Urtuu #3, (nine if you count the one who appears slightly lost to the south) and another dozen or so camped somewhere out on the steppe. There were a handful of penalties assigned at the end of day one, as well: Eleven veterinary penalties were issued to riders for “speedy riding and rather daring navigation.” They will get two hours of penalty time each, where they’ll be required to wait two extra hours at checkpoint #11 whenever they arrive there. Two riders received a late penalty for continuing on 30 minutes after the cut-off time at 8:30. They had initially planned to camp, then changed their minds and gone on to station 3. They will be penalized three hours each. According to the organizers, it’s not unusual for riders to get penalties in the first couple of days as they learn to navigate the terrain, judge their horses better, and estimate time and distance. Then usually the penalties drop off quite a bit. With the 12-hour time difference from Mongolia to the East Coast, we get underway again later tonight at around 10 p.m. EST. You can click each dot to see who the participant is, how far they’ve traveled, their average speed, and if they’ve uploaded information ahead of time, some of their biography. At a specified hour, all competitors — whether on course or stopped at a checkpoint — have to stop moving forward and hunker down until morning. Occasionally, the GPS devices seem to be going offline and then pinging again later on. This is why it looks like some competitors are traveling in straight lines, when in fact, they’re twisting and turning through canyons, hill country, and around rivers and lakes. The Mongol Derby Live Updates on Twitter are the best moment-by-moment info during the race. They’re using initials for riders to make things easier. Leslie’s call sign is LW. You can get a full list of abbreviations here. Leslie’s progress as of 6:15 EST this morning (the red dot). Despite fan theories that she had taught her pony to fly, it’s more likely that her GPS tracker went offline slightly before pinging again, giving her the appearance of some incredibly straight direction of travel. Left to right: Nanna-Riikka Nieminen, Brent Kuylen, Jackie Potts, FEI President Ingmar De Vos, Alan Davies. Photo courtesy of FEI Media. Following a survey of national federations by the FEI, it was determined that grooms were vastly underrepresented and underserved in the governing body of all major equestrian sports, and the FEI has begun the process of making it right. The FEI invited four world class grooms from show jumping, eventing and dressage to come and speak with the FEI’s president and give their role in the sport a voice. Thanks to input from Brent Kuylen of Belgium who grooms for Jeroen Dubbeldam (show jumping), Nanna-Riikka Nieminen of Finland who grooms for Henrik von Eckermann (show jumping), Alan Davies who grooms for Charlotte Dujardin and Carl Hester (dressage) and Jackie Potts who grooms for William Fox Pitt (eventing), it’s been determined that grooms will now be officially registered with the FEI in their own role. Through this registration, grooms will have their own interface with the FEI to streamline paperwork, educational opportunities, and prepping horses and riders for travel and events. The FEI says they will now focus on integrating, building a registration process and outreach to start an education and communication portal. There will also be additional meetings with grooms in coming months–the next meeting will include additional grooms from more disciplines and will be held in conjunction with the 2018 World Equestrian Games. Kiss and cry cameras have helped highlight some of the connection grooms have to their horses, and more riders are doing their part to give their grooms public credit, but official recognition should be the first step in many by the FEI in demonstrating the importance of grooms to world-ranked riders and the success of the sport. 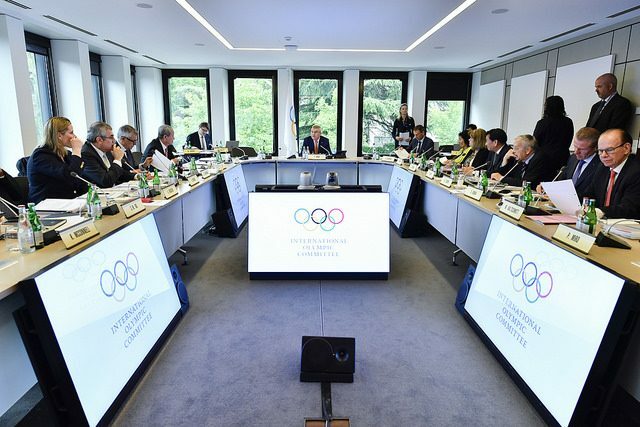 Meeting of the IOC in Lausanne earlier this week. Photo courtesy of IOC Media. This post was originally published on EN’s sister site Jumper Nation. Check out JN for news and commentary from the hunter/jumper world and beyond! On Wednesday, the International Olympic Committee released the site evaluations for the two remaining cities bidding to host the Olympic Summer Games in 2024. These site evaluations require each city to describe in detail where each event would be hosted, from water polo to track & field to kayaking. This includes the equestrian events, and both Paris and Los Angeles have indicated their proposed plans for the world’s top horses. 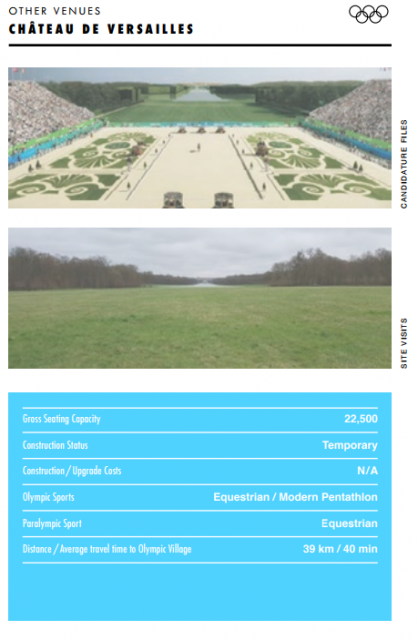 Paris, if selected, has chosen to host dressage, show jumping, and eventing (assuming all those sports are included in the 2024 program) at the Palais de Versailles, a massive complex best known for its chateau, but which also recently hosted its first CSI 5* Show Jumping event this year. 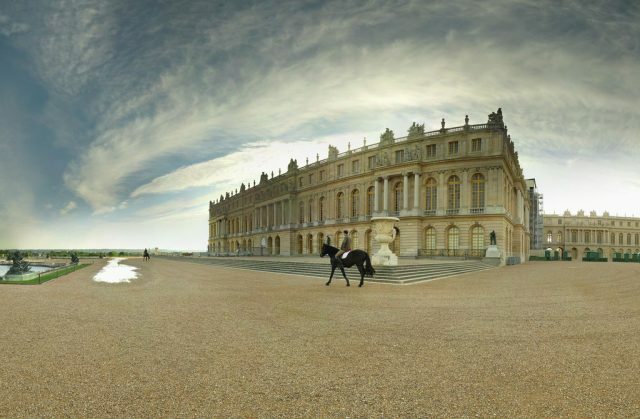 The Chateau des Versailles. Photo: Panoramas/flickr/CC. The complex of multiple buildings and grounds directly west of Paris is an elegant venue with sufficient acreage to host all three events, including the cross country portion of three day eventing. There is a long-standing equestrian academy on site, and the entire estate is steeped with horse history over the centuries. According to the IOC evaluaton, the spectator stands for the arena events will be temporary construction and have a capacity of approximately 20,500 (Rolex Stadium capacity, for comparison holds about 8,000 in the grandstand and 30,000 with the additional bleacher seating.) Versailles is 40 minutes from the Olympic Village, which is comparable to previous host cities. 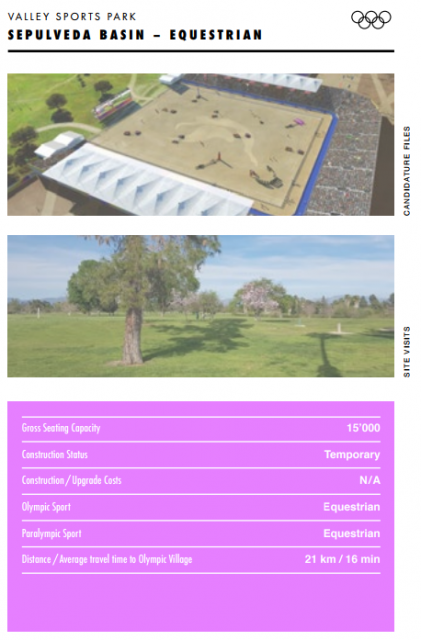 If Los Angeles has the opportunity to host the 2024 Olympic Games, they’ve chosen the Sepulvida Valley Sports Complex as the host site of the equestrian events. About 11 miles from the Olympic Village at UCLA, Sepulvida Basin’s acreage will – according to the hosts – be sufficient to host all three equestrian disciplines, canoe slalom, and shooting. The temporary arena will have a seating capacity of 15,000, and there is large, uncultivated space that should be sufficient for a world class cross country course. No buildings, residents, or businesses will be displaced by the Games, as the Sepulvida Basin is currently a sort of “under-utilized” space. Though as it happens, there is a reason for this: The basin is an emergency flood zone, intended to stop significant damage in the city if the Los Angeles River were to overflow. The good news is: August is most definitely not a time of year that California experiences flooding, and even in the high water rains earlier this year, the basin’s use as a flood plain was limited. Both Paris and Los Angeles would be repeat Olympic Games hosts; LA hosted the 1984 and 1932 Games, and Paris the 1924 Games. There is a candidate city briefing for the IOC Committee next week in Lausanne, Switzerland, and the final host city selection vote will take place in Lima, Peru in September of this year. In Jumper Nation’s first post-win interview, Taylor St. Jacques of Glen Allen, Virginia made it clear that she came to Devon full of warmth for the venue and fire for the win – four wins to be exact. In two days, Taylor and Heritage Farm’s Charisma claimed the top WIHS score out of both phases, the Pessoa Medal, her Maclay group yesterday, and finally the Ronnie Mutch Equitation Championship. While it’s an incredible feat, anything less would not have met Taylor’s expectations. Taylor and all the riders in the final – six elegant young equestrians to be exact – executed nearly without fault a technical course which required both horse and rider to be steady early on, stretch themselves for some forward bending lines in the middle of the course, and finally pull it all back together for the final series of fences. It was Taylor’s event to lose going in, and even with the challenge of going first, she executed smooth lines and perfect striding and distances throughout, ensuring no one would be able to catch her. Also throwing down a nearly flawless round was Reserve Champion and 2015 Maclay Final winner McKayla Langmeier aboard her mother Linda’s Calberon B. McKayla worked hard to get her striding without making it look hard, and no doubt gave the judges plenty to think about with her trip in the final. 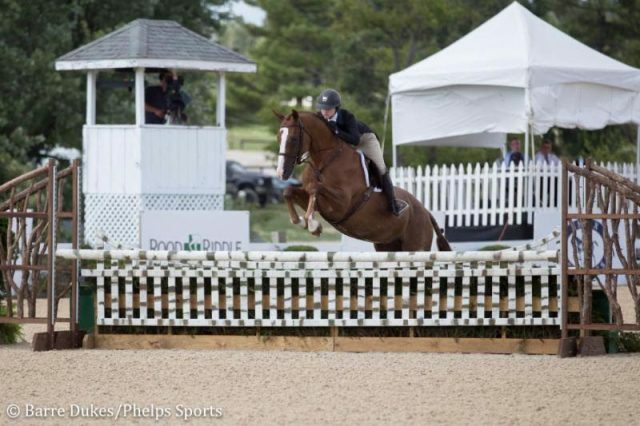 It’s an impressive accomplishment for a horse who as recently as the end of last year was getting passed around to a lot of riders for several years as a low jumpers mount for both juniors and adult ammies. He had virtually no equitation experience before coming to the Langmeiers (McKayla trains with her parents, Kenny and Linda), and in half a season has become one of the most formidable eq horses in the business. Annabel Revers and Quax, fourth place. Screenshot via USEF Network. Annabel Revers and Quax took home the yellow ribbon in the championship, qualifying in the last possible class by winning the C section of the ASPCA Maclay. Annabel and the 16-hand Oldenburg gelding had to stretch to match the strides of the larger horses in spots, but made the steady work look absolutely flawless. The pair have been together for two and a half years and know how to make each other soar. Hayley Redifer of Barboursville, Virginia and Ballon took fourth in today’s final with a workmanlike performance that got the job done, as did Samantha Cohen of New York, NY, who secured fifth place aboard Kaskade after finding a couple of barely long distances in a field where inches made all the difference. The only mishap of the afternoon was Cooper Dean’s trip with Kori D’Oro, who it appears just failed to lock on to one of the moss-covered oxers on course and the two had a drive-by, ending their shot at the title. It’s a younger horse at only eight in a sea of veterans who still made a huge impression over the weekend, and we imagine we’ll see back in the eq winner’s circle again this year. While the equitation classes at Devon are complete, there is still much more junior action to come at Devon in the junior hunter and jumper divisions. Keep it locked on JN for more from the Blue Oval! *Many thanks to field reporter Kristen Kovatch for her contributions to this story! It was the end of an era for a horse and rider who opted to go out together after finishing in style: 2016 Individual Olympic Gold Medalists Nick Skelton and Big Star officially retired Sunday at the Royal Windsor Horse Show. In front of Her Majesty Queen Elizabeth, family, friends, fellow Great Britain team riders and a massive standing crowd, Nick and Big Star hung up both saddle and spurs at the country’s most prestigious horse show. At 59 years old, Nick has spent more than four decades at the upper echelon of the sport, and is one of the oldest individual gold medalists in Olympic history in any sport. Big Star makes his retirement at only 14, but after an injury in the fall, Nick and his team made the decision the pair would complete their careers together, and that Big Star has done his part for show jumping. After a final victory gallop, Nick removed Big Star’s saddle and went for a final lap in-hand in front of a jubilant — albiet tearful — British crowd. Grab a tissue before watching the video! We wish Nick and Big Star the happiest of retirements together. Another cross country day at the Rolex Kentucky Three Day Event, another sprouting of new dandelions in the grass at the Kentucky Horse Park. Dreams were fulfilled and dreams were broken. That’s why we play the game. If we all went out and rode them clear every Saturday, there’d be no point in attempting it. Sometimes the failure is the thing that makes you regroup and come back twice as hard the next year. Sometimes it’s the thing that makes you wonder why you didn’t go into accounting like your mother said you should. But most important, every horse came back to the barn tonight to get ice boots, massages, electrolytes and lots of love from all their connections. Hearts may get broken on Rolex Saturday, but if every horse gets home safe, there is nothing more we can ask of this magnificent sport. GHM with the US Team of (From L-R:) Joe Fargis, Melanie Smith Taylor, Anne Kursinski, and Katie Monahan Prudent after they won the Nations Cup at Rome in 1983. Photo Credit: L’Année Hippique, Courtesy of Jennie Carleton. There’s a dark allure to the Global Champions Tour for me. One the one hand, the grandeur and spectacle of it all is mesmerizing. On the other hand, it also makes the whole dream of it feel so far away. It sometimes feels like they’re literally living on another planet from us. A world filled with first class tickets from one show to the next, and a team of people to get you there, while we change a muddy tire on our run-down truck on the side of the road for the umpteenth time. It’s amazing and depressing all at once. It brings me back to earth when you see moments like the one we brought you last year of Nick Skelton and Laura Kraut spreading their own shavings at a show, or the humble attitude and graciousness of McLain Ward after we won the FEI World Cup Final. But my favorite “YOU CAN DO THIS” anecdote comes from a little further back: Olympic gold medalist Melanie Smith Taylor. If you consider everything you know about GHM, you can imagine how horrified he was at the sight of that purple concoction. You can guess the looks she got from other riders. But dang, the girl could ride. She had to make a few more good impressions on him before she got her shot, but finally, he invited her to come along to the winter circuit in Florida. When she won the first recognized jumper class she ever entered, George invested in her 100% until the day she won her Olympic Gold Medal. Melanie had to work ten times as hard as his other students – trading lessons for grunt labor of mucking stalls, braiding, and exercising horses. But that hard work turned her into a machine, and she never took a single lesson for granted. Arguably, having less resources didn’t hold Melanie back – it made her into a champion. Melanie of course went on to be one of only two riders to ever win the Triple Crown of American Show Jumping: The American Invitational, the International Jumping Derby, and the American Gold Cup. She won the FEI World Cup Final in 1982, and was part of team gold at the Los Angeles Olympic Games in 1984. She made it happen through sheer will and hard work, not through dollars and cents. Never be embarrassed by being scrappy – own it. If a matching purple station wagon and horse trailer are what you’ve got to work with, then you’ve got skin in the game. Own your reality, and then work and ride your guts out. Find mentors and benefactors who believe in you. Melanie is one of many riders whose career was made by generous geniuses of the sport who saw a spark and fueled them to become a flame. Show your spark, and share it with the right people. See yourself the way your mother sees you. When Melanie first rode with George, her mother was a sensible but firm advocate. When George asked Mrs. Smith where she wanted her daughter to end up, she responded with, “How about the Olympic Team?” Be that advocate and pursue that confidence in yourself every day until you reach your goal, then set a new goal. If the pinque coat is the thing you want more than anything else in the world, do not let money stop you. Do not make excuses. Do not give up. This is the great adventure of our sport, and you have the same right to glory as anyone else. Go Melanie, Go Jumping, but most of all, GO YOU. If you’re interested in Unrelenting: The Real Story—Horses, Bright Lights, and My Pursuit of Excellence, visit Trafalgar Square Books online to pick up a copy. Melanie Smith Taylor also has a recently released book called Riding With Life: Lessons from the Horse which you can purchase here. Photo courtesy of Gabby Smith. A big congratulations and good luck to a longtime barnmate of mine, Gabby Smith, who is soon headed off to beautiful sunny California to be a working student at Next Level Eventing. Gabby will be gaining entry into a world-class program, and the gals at NLE will be gaining one of hardest-working young women I’ve ever come across. Our loss is California’s gain, but we wish her the absolute best of luck in pursuing her goals! The Sonoma Horse Park in Sonoma, California has announced that they will be waiving entry fees for all Young Hunter and Young Jumper classes in the 2017 show season. With more than a dozen young horse classes each week throughout the show year, this amounts to thousands of dollars lost for the event, but they insist that is not their priority. “We want to support the development of young horses and encourage riders and trainers to show young horses,” show organizers said in their announcement. Sonoma Horse Park is the largest series in Northern California, and set in one of the most picturesque locations in the world with wine country to the north and San Francisco to the south. With gorgeous show grounds, a veteran show manager in Sally Hudson and generous rider incentives such as waiving young horse fees, Sonoma is making its mark. Entries close Tuesday, April 18th for SHP Spring Classic & HMI Equestrian Challenge. Enter online at showgroundslive.com/headlands and equestrianconnect.com.